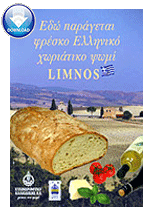 Back to tradition with stonemill ground whole wheat flour to bake aromatic wood pan loaf bread locally called *pinakotis* with excellent aroma and flavor. Top quality hard wheat from the Macedonians land, rich in fiber and vitamins to produce high quality loaf bread. Suitable for the production of original yeasted bread with good flavor, aroma and great durability.